This poem's beginning translates as "Rays of the setting sun shine on village homes; In a narrow lane, water buffalo and sheep return." 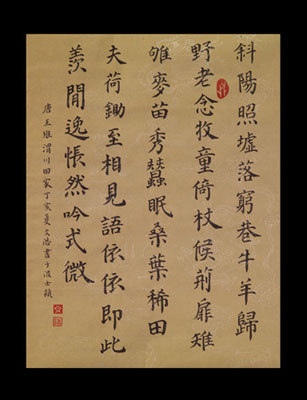 Wen-Hao Tien first practiced calligraphy at ten, but felt her lack of training keenly. " I practiced calligraphy, but without a master." Bai agrees, "It's like someone playing piano without a teacher." During an apprenticeship session, Bai looks over Tien's characters, then points out things to be corrected, saying, "Too small, a bit crowded." He moves on to another character: "This is good." She smiles.